Mr Hakan Özgökçen joined the firm in 2007. 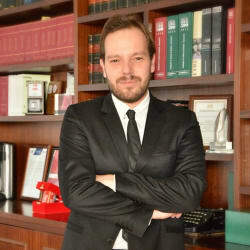 He graduated from Marmara University Law School in 2003 and received an LLM degree from Istanbul Bilgi University during 2010. Mr Özgökçen has been a member of the Istanbul Bar since 2005. Mr Özgökçen became a partner within the Regulatory and Compliance department of ELIG Gürkaynak in 2015 and has extensive experience in competition law, mergers & acquisitions, contracts law, administrative law and general corporate law matters. Mr Özgökçen has represented defendants and complainants in complex antitrust investigations concerning all forms of abuse of dominant position allegations, along with merger notifications and clearances, and cartel legislation and enforcement. He has also represented various multinational and national companies before the Turkish Competition Authority and Turkish courts. In addition, Mr Özgökçen is active in writing and speaking on competition law matters, having authored and co-authored many articles and essays and spoken at several conferences and symposia.